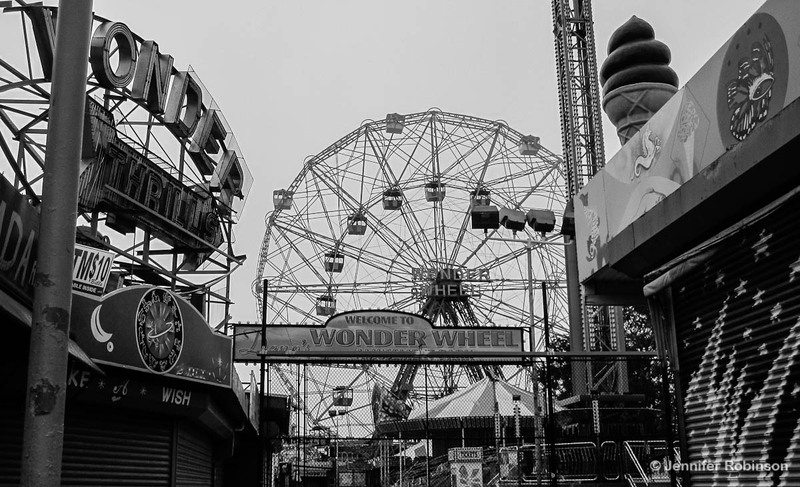 The famous Wonder Wheel rose slowly from the fog as the F train crawled towards the Stillwell Avenue station. Its cars swung empty in late September, abandoned for yet another winter season as tourists and urban denizens returned to reality in the Big Apple. 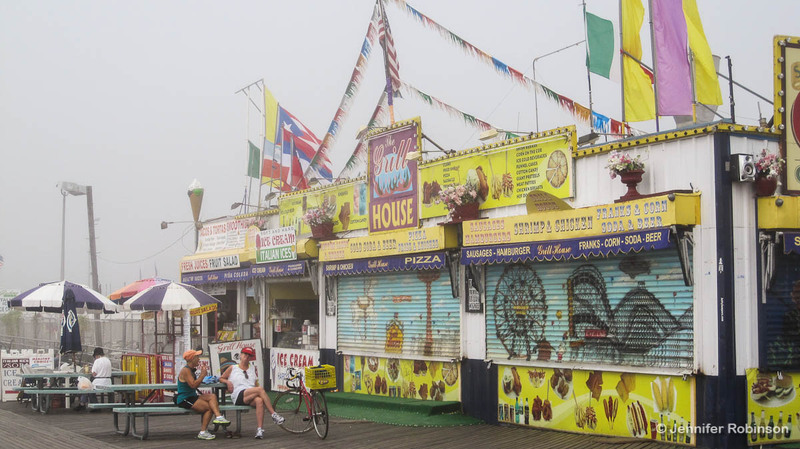 On the boardwalk, one concession stand after another sat shuttered — some like Cha Cha’s, the “Home of Wild Women and Wise Guys” — seemed destined for the history books after their leases weren’t renewed. 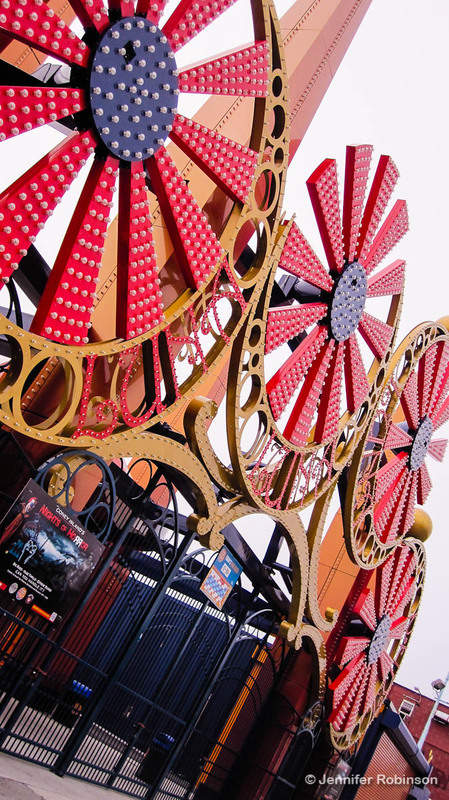 But like a phoenix, Coney Island and its motley assortment of independent shops, amusement parks and solitary museum officially opened its seven-day-a-week season last month on Memorial Day weekend. There is no doubt its collection of freaks, carnies and business owners are fighters. Cha Cha’s has reopened in a brand new spot on Surf Avenue, while Paul’s Daughter and Ruby’s were granted eight-year leases after years of uncertainty. All three eateries were part of the Coney Island 8. The longtime mom-and-pop operations were threatened with eviction after an Italian company Zamperla USA took over management of the land from the city and moved to spruce it up with more family-friendly offerings that can operate year-round. Zamperla also operates Luna Park and Scream Zone, two of the area’s amusement parks. 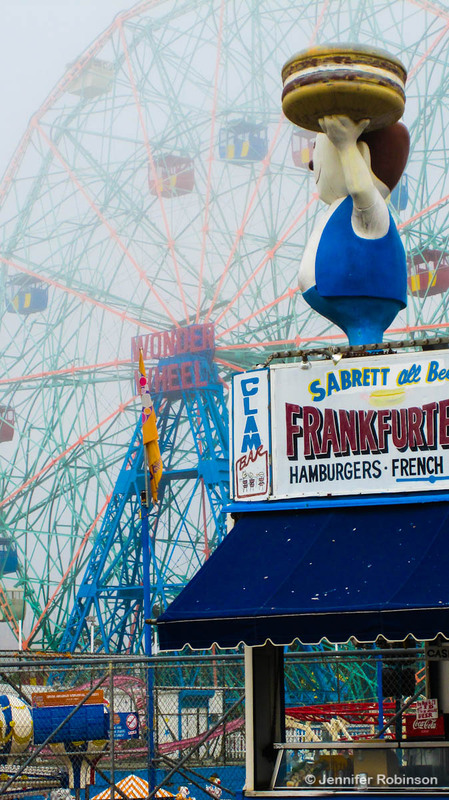 It would be a shame to lose these older establishments with their world famous hotdogs (Coney Island created them, after all), clam bars, cotton candy, fried dough, and funnel cakes. But what is even more disturbing is the attempt to make Coney Island respectable. Part of the lingering allure of this place, and really all carnivals, is the seediness, the transient nature of the short summer season, the sticky sweetness of a short-lived summer romance, and the colourful characters who keep the rides and rigged games going year after year. There’s an old timey magic about. It’s a connection to the historical past and our childhoods. At the carnival, anything seems possible. When I visited Coney Island, everything was shuttered for the season and an impenetrable fog enveloped the board walk and theme parks. Over the course of its summer season, hundreds of thousands of visitors trundle over the famous wooden (and now plastic in sections) boardwalk and consume copious amounts of hotdogs and beer. In the haze on that late September morning, you could sense the ghostly imprint of all those visitors, reaching back to Coney’s amusement park start in the 1860s. Visiting a place usually teeming with life when it’s empty is a surreal experience. It reminded me of going to my 100-year-old elementary school one morning super early with my mom, a school teacher. The odd forgotten hat hung from coat hooks in the hallway and prized artworks fluttered from the walls. You could hear faintly the babble of voices excited to head to the playground and the stomp of snowy boots on the rubberized stairways. I kept looking behind me, sure someone was there in the dark. But I was very much alone. It was much the same in Coney Island. The fog had smothered the screams from the Cyclone and dampened the smell of cotton candy but it was still there, permanently etched into the bones of the place. Smears on the boardwalk told of spilled hotdogs and dropped ice cream cones (and the tears resulting), while on the empty beach I could imagine the throngs of 19th-century sub worshippers with their sun parasols and ridiculous bathing costumes. For a real glimpse, check out these vintage photos from the New York City Municipal Archives Online Gallery. The subway was eerily empty for the last few stops before Stillwell. The couple I disembarked with quickly disappeared on the wonderfully named Surf Avenue. Perhaps, they had seen nothing was happening and simply gotten back on the train. Perhaps. The first sign you’re in Coney Island, aside from sightings of the Cyclone and Wonder Wheel from dirty subway windows, is the Coney Island Museum. Keeping the carnival freaks at the forefront here is Coney Island USA, a non-profit organization that operates the museum and produces the Creepshow at the Freakshow and the annual Mermaid Parade, set this year for June 23. They even offer a sideshow school where wannabe sword swallowers, human blockheads, fire eaters and snake charmers can hone their craft by learning from the best. 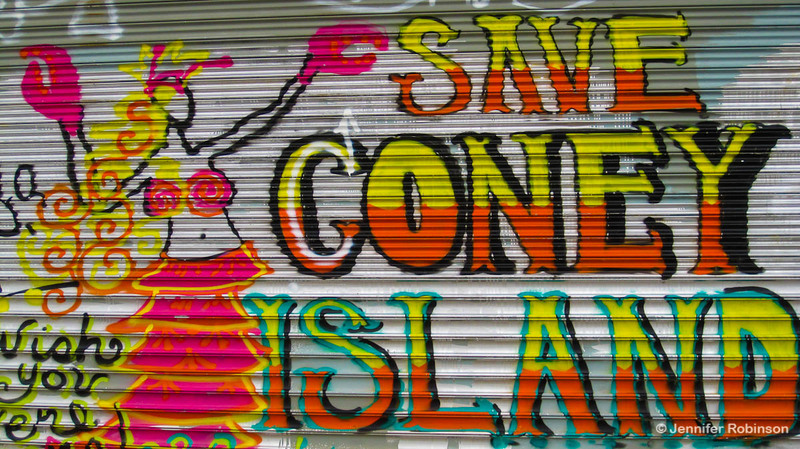 According to their website: “Coney Island USA was founded in the belief that 19th-century American popular culture gave birth to a democratic cultural golden age, unique to this country’s history and indispensable to its future.” Coney Island is the antithesis of high culture. Entertainment here was and is firmly grounded in the tastes of regular blue-collar Joes and Janes. It’s tacky but it’s also authentic Americana. Everything about the Coney Island Museum makes me wish I’d had the chance to visit the area during the height of its popularity at the dawn of the 20th century. For example, the museum features a cosmorama marking the burning of Dreamland on May 27, 1911, billed as “New York’s second most devastating disaster.” This bizarre theme park – too strange, politically incorrect and downright dangerous too survive nowadays — featured Lilliputia where three hundred midgets lived; a daily demonstration where 2,000 people pretended to put out a six-storey blaze; re-enactments of the Boer War, the San Francisco fire, the destruction of Pompeii, and the Galveston Flood; not to mention an exhibit of premature babies saved by the new technological wonder of baby incubators. WOW! And admission to the museum is only $5! For another glimpse into Coney Island’s strange history, visit the Coney Island History Project’s exhibition center at the entrance to Deno’s Wonder Wheel Park. The exhibition — which is free — includes historical artifacts (an original horse from the legendary Steeplechase ride and a “fairy whip” car), films and photos, including an exhibition until July 1 of Abe Feinstein’s work entitled 50 Years of Coney Island Photography. Their website also includes a wonderful section called Ask Mr. Coney Island. It caters to residents and tourists who have visited the area and includes historical photos and interesting facts. For example, I had no idea there used to be a giant elephant hotel here. Seriously. Known as the Elephantine Colossus, the seven-storey, 45-metre-tall hotel burned down in 1896. No doubt the place was a firetrap. If they truly want to revitalize Coney Island, why can’t they bring back the elephant hotel? Along with gaping wide mouthed at the freaks, the other way residents and tourists have walked on the wild side at Coney Island are the death-defying rides. One of the oldest amusements still in existence is the Cyclone. The wooden roller-coaster,which opened in 1927, is located on the former site of the world’s first roller-coaster — the Thompson Switchback Railway, built in 1884. In 1985, a man died after he was struck on the head while standing up during the ride. A similar incident occurred three years later when a maintenance worker also stood up while the ride was operating. He fell to his death. In 2007, an 80-year-old man died following surgery to repair a neck injury he allegedly suffered on the ride. His family sued the city, which currently owns the coaster. The safest and oldest ride at Coney Island is the aforementioned Ferris wheel known as Deno’s Wonder Wheel, located off West 12th Street. Built in 1920, the 45-metre-high wheel is a historical landmark with a perfect safety record even during a New York City-wide blackout in 1977, according to the park’s website. For just $6 a ride, the view of Coney Island must be spectacular from the top, especially on a perfect day in July when close to a million people visit the area. And, for the first time in 30 years, new solar powered lights will illuminate the beautiful Ferris wheel at night. The lights are being placed on the wheel’s 16 swinging cars but there’s no word on whether the lights have started working yet. Keep your eyes peeled! For the 2012 season, three new rides were also added at Coney Island’s various amusement parks. They include: Boardwalk Flight, which swings riders 30 metres into the air and out over the boardwalk, a go-kart track called Coney Island Raceway (both located at Scream Zone) and the MegaWhirl at the new Steeplechase Park. On a quiet day when the amusements are shuttered and the fog is thick, the boardwalk still has a magical quality. The crunch of scattered sand gripping footwear on the weathered wood and muted conversations almost exclusively in Russian are the only distractions from the silence. I became aware as I walked of how Coney Island is more than a summer escape, it’s also a community filled with highrises and low slung stores as you inch closer to Brighton Beach. 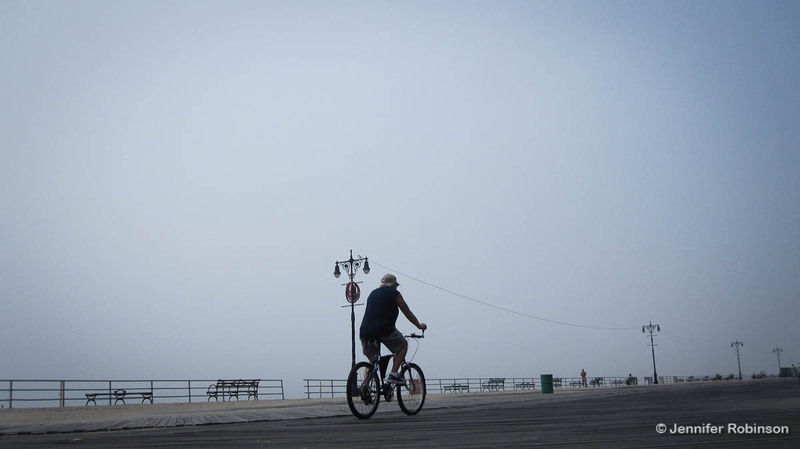 Recently, New York City voted to replace the wooden planks with a cheaper mixture of plastic and concrete in a five-block area despite a boisterous protest by residents and Coney Island lovers. The city is spending $30 million to renovate the 3.7-kilometre walkway. So, if you’re in New York this summer, be sure to venture out for a walk on these 89-year-old planks. Imagine the stories they could tell. Already, designers have snapped up some of the old planks to create one-of-a-kind furniture and Ruby’s Bar is using it to freshen up its interior. At least it’s not simply being thrown away. Change is inevitable and sometimes it’s for the good. I don’t know about you, but I’m glad I was able to visit Coney Island before all the old buildings and sights are lost forever. Go in the fog, it’s a more melancholic experience. 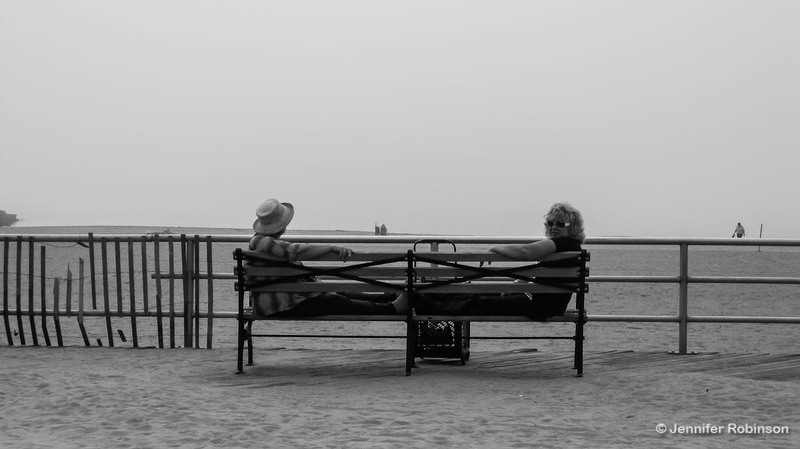 Love this post on Coney Island! I haven’t been there for several years, but its such a cool place to shoot! Thanks for checking out my blog. Hey no worries and thanks for the love! I enjoy your blog postings.